Edgar is designed to recycle your content on Facebook and LinkedIn** so that more and more of your audience sees it, driving more traffic to your site. We do not recommend setting all of your content to expire. Evergreen posts should not have an expiration date. However, if you do have time sensitive content (such as current event news, a specific conference or event you're promoting, etc. 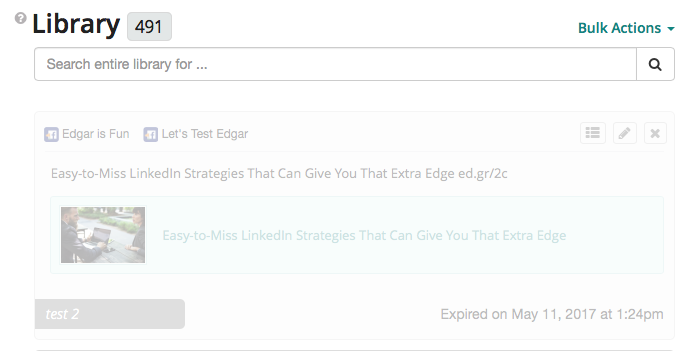 ), set an expiration date on your posts, and Edgar will stop publishing them at the time you choose. To add an expiration date, click Advanced Settings. Check the box next to "Expire content at a specific time and date" and choose a time and date in the future for your post to expire. Note: be sure to check the year on the date! Posts with an expiration date will be available for posting by the Queue until that date has passed. Once content has expired, it will no longer be published and it will be grayed out in the Library. Expired posts that are reactivated will be recognized by the Queue as new content and will be published in the next available time slot for that category. **My post says it's only expired for Twitter. What does that mean? Create a new category for the posts (i.e., Spring or Thanksgiving, etc.) and uncheck the box that includes the category in random. Save category. Add your seasonal posts to the category. Place the category on your schedule when you’d like Edgar to start posting them. Remove the category from the schedule when the season or event ends. And when that season rolls around again next year, repeat steps 3 and 4! Edgar won't publish these posts after the category is removed from the schedule, but you’ll still have the posts in your library for reuse on Facebook and LinkedIn when the same season/event/promotion becomes relevant again. 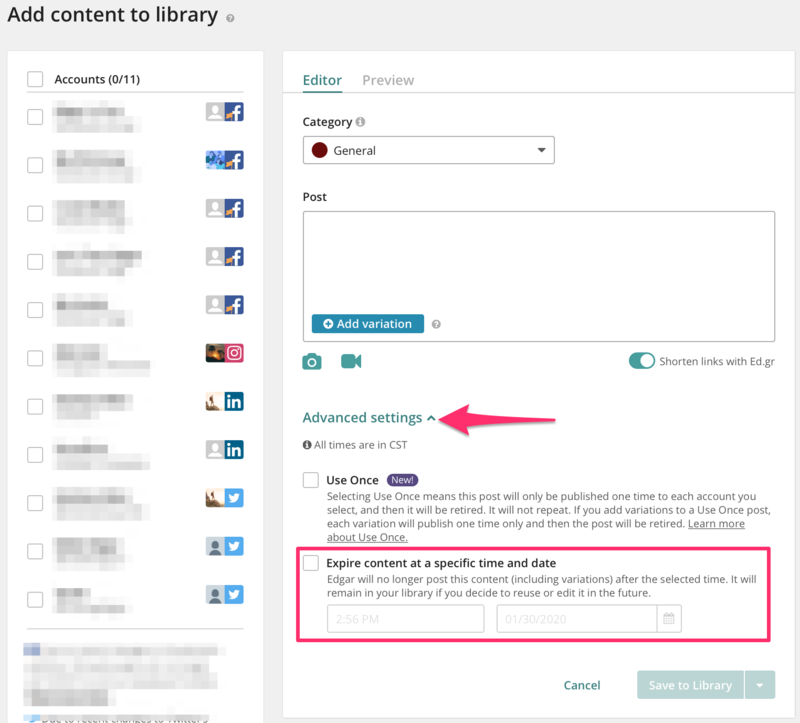 Previously published content will only be recycled to Facebook and LinkedIn if you put a seasonal category back on the schedule in the future. New variations will be required to post the content to Twitter.